World Travel Awards serves to acknowledge, reward and celebrate excellence across all sectors of the global travel and tourism industry. World Travel Awards has revealed that its Latin America Ceremony 2019 will be hosted in La Paz, Bolivia on 13th July 2019. The leading figureheads, decision-makers and influencers of Latin America's travel and tourism industry are scheduled to attend the ceremony, which will mark WTA's first visit to Bolivia. World Travel Awards has revealed it will host its Africa & Indian Ocean Gala Ceremony in Mauritius on 1 June 2019. The leading travel industry figureheads and decision-makers from Africa and the Indian Ocean will attend what will mark WTA’s inaugural visit to the paradise island. World Travel Awards has revealed that its Middle East Gala Ceremony 2019 is set to take place on 25 April 2019 at Warner Bros. World™ Abu Dhabi in the UAE. The park is the latest addition to Yas Island’s theme parks, joining Ferrari World Abu Dhabi and Yas Waterworld. The music and hospitality pioneer, Chris Blackwell, has been honoured at a star-studded gala ceremony in Montego Bay, Jamaica. The founder of Island Records and Island Outpost was acknowledged with the “Lifetime Achievement Award” at the World Travel Awards Caribbean & North America Gala Ceremony 2019. The red carpet evening, which was hosted at Sandals® Montego Bay, marked the opening leg of the WTA Grand Tour 2019 – an annual search for the finest travel and tourism organisations in the world. World Travel Awards is pleased to announce its annual “call for entries” for inclusion in the most prestigious awards and recognition initiative in travel and tourism. Each country's very best brands and products are now invited to submit their applications to participate and stand a chance to win the ultimate industry accolade. 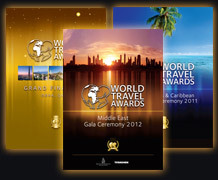 Madeira has been revealed as the host for the World Travel Awards (WTA) Europe Gala Ceremony 2019. The Portuguese destination, which has taken the title of Europe’s Leading Island Destination for the past five years, will use the event to boost its profile on the international stage. The finest travel brands in the world have been unveiled at a star-studded gala ceremony in Lisbon, Portugal. The elite of the travel industry gathered for the World Travel Awards Grand Final Gala Ceremony 2018 at the historic Pátio da Galé to find out who amongst them had been crowned the finest in the world. Visit our Winners' Area to find out how you can further promote your success and excellence as a World Travel Awards winner. Independent Ireland: Single-use plastics may be the new smoking, but have hotels got the memo? Read our latest publications online.